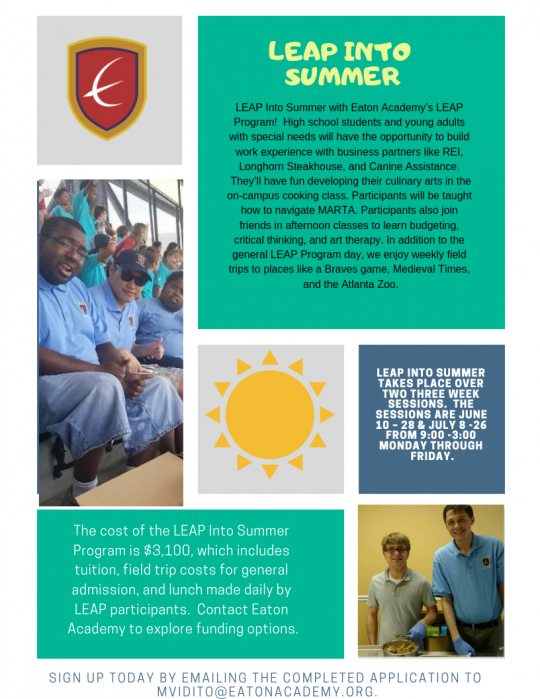 Eaton Academy emphasizes a personalized approach to the admissions process and employs an open enrollment policy. This process focuses on the uniqueness of all students and addresses the goals of their families. Diversity is respected and celebrated at Eaton Academy. Call us at 770-645-2673, ext. 242 and ask for Admissions Director Margie Cohan, or e-mail Margie. Call us at 770-645-2673, ext. 238 and ask for Marc Vidito, or e-mail Mark. You can download all pertinent application forms and our Parent Student Handbook from our Application Forms Page. The Student and Exchange Visitor Information System (SEVIS)/Department of Homeland Security (DHS) has certified Eaton Academy to issue Forms I-20. Having been awarded this authorization, Eaton is able to admit foreign nonimmigrant students and provide for their academic needs. Please contact Brian L. Uitvlugt for additional information. traditional style pants (such as khakis) and skirts of appropriate length. Shorts of appropriate length may be worn during the months of August, September and May. On Friday, students may wear appropriate jeans and T-shirts without pictures, advertising, et cetera. Students will not be admitted to class and may be sent home at the discretion of the administration for unacceptable dress and appearance. Some examples of unacceptable dress and appearance are: overly baggy clothing; athletic wear; excessive body piercings; hair styles and coloring which attract attention; bare mid riffs; spaghetti straps; low necklines; visible underwear; tight or revealing clothing; and sandals/backless shoes.